Come & create with us! Our faculty members are experienced and creative art teachers who love to explore the world of art with children and young adults. Students ages 15+ are able to enroll in adult courses. phone, 781-383-2787 or email, info@ssac.org. 2019 PRE-COLLEGE COMPETITION AND MERIT AWARDS! See Adult Courses for Adult Merit Award Opportunity. PRE-COLLEGE AWARDS for HIGH SCHOOL SENIORS! SOUTH SHORE ART CENTER offers annual monetary awards for graduating high school seniors attending public or independent schools. Eligible students must be graduating this year and have been accepted by a school of fine arts or an accredited institution of higher learning that includes a fine arts curriculum. Students can use award money towards buying art supplies, college class expenses, or other educational needs at their discretion. • Cover letter with your name, address, phone, email, name of high school currently attending, and name of college(s) to which you have been accepted. • Personal statement and/or resume. • A portfolio of work with 8 to 15 examples of your best including a self-portrait or portrait done from life and a composition drawing or painting using representational subject matter in any medium. Submit images of your work on a Flash Drive/CD with application. • Semi-finalists will be required to show 3 pieces of original work delivered upon request to SSAC. • Finalists who are awarded prizes will be required to submit one original piece matted and framed to be exhibited at our Summer Arts Festival June 14, 15, and 16, 2019. 3. Sessions may have up to 4 students. If you prefer individual mentoring, the cost increases to $50M $70NM an hour. 801 BASIC DRAWING—This is the place to start. Everything stems from drawing. oil or acrylics. Make a mess or be neat. Compose on the stage of the canvas. 30 minute poses—discover new ways to express the ever-changing form of the figure. 805 Pastel Landscape—Amp up the color of the landscape using soft pastels. Learn many techniques while creating beautiful landscape paintings. 806 Printmaking—Express your inner animal through printmaking. We will create multi-colored prints based on the animal in you. 814 Artist Choice—Students will request their own medium and direction. Picnic in the galleries and enjoy beautifully illustrated children books celebrating masterful writers—Maya Angelou, Henry Thoreau, and Alice Walker. Children delight in hands-on art projects specifically designed for preschoolers. Opportunities are created for both children and their adult caregivers to sit side-by-side and connect to the creative beauty of the written word and visual arts. Children’s picture books have provided us with memorable stories and characters and are a wonderful inspiration for art lessons. Story books with seasonal themes will be the inspiration for our creative art discoveries. Young artists will interpret the stories and fables using clay, pastel, and book-making of their own flair. Characters from beloved children’s books such as Mr. Seahorse by Eric Carle, A Color of His Own by Leo Lionni, and Tipi by Paul Goble, come to life through drawing, painting, and sculpture. Children are encouraged to use and explore new materials and art techniques to express imaginative responses to this rich field of literary art. Mini artists’ imaginations take flight creating original works while learning elements of art such as line, shape, texture, and color. Springtime and all the inspiration it brings will be explored with emerging artists. A wide range of materials, including various types of clay and painting media, will be introduced in enchanting thematic art lessons. Students will develop artistic and social skills in a positive and supportive learning environment. Students will enjoy diverse art experiences that will encourage creativity, stimulate imagination, and inspire self-expression. Young artists will discover how drawing, painting, sculpture, and collage may be used as vehicles to unlock a surprising world of images both personal and expressive. Students will learn about what makes visual art expression unique, how artists have used a variety of methods and materials to express ideas and feelings, and how they, themselves, can be effective communicators. Students will build on skills important for school success such as fine motor skills,language, cognitive skills, and the ability to listen and follow directions in an enchanting and supportive environment. This class is one of the Art Center’s favorite course offerings. How can you express your most colorful ideas? With paint, of course! This class is a painting lab designed to illustrate the many ways paint can be used to enhance fanciful ideas into visual imagery. It is also an opportunity to explore sensory imagery through the vehicle of color – How does color sound? How does it feel? Is it bright, dull, dark light? Is it pleasant or unpleasant? When paint is applied to paper, explosive color flows across a white space such as red, orange, yellow playfully bring out an emerging flower or a lion hiding behind a tree. Explore how color and brush can transform an idea into a paradise of your own design. A variety of paint mediums from acrylic to watercolor, and tempera, will be splashed on to the surface of different kinds of paper. Techniques, such as splatter for leaves of a tree, dry brush for the texture of rocks, wet to wet blending for fantasy landscapes and skyscapes will become the basis for a fun time learning experience for children. No class May 27. Let your children sink their hands into cool clay and create wonderful, colorful ceramic pieces. Students will be encouraged to experiment and use their imaginations while developing motor skills in activities designed to promote the creative expression of ideas. Finished pieces will be glazed and fired. 150 Art Expressions—Moving On Up! Students will be exposed to a variety of clay projects geared to all types and levels of experience. Hand built coil, slab, the potter’s wheel, and the glazing technique will be explored. Bring your creative ideas and your imagination—and dig in! Finished clay pieces will be glazed and fired. This class will introduce students to examples of art and craft from other cultures as the inspiration for individual works of art. Come and explore roots, rhythms, designs and traditions from around the world in a creative and supportive studio environment. Children will grow to understand others by playing with visual ideas and experiencing artistic expression through projects inspired by works from diverse cultures. Comic art (sequential art) has been around since prehistoric times. Today, it is a very sophisticated form of storytelling that involves a wide range of subjects, styles, and themes. Far more diverse than just superhero stories, comics can tell stories of everyday life as well as fantastic adventures exploring social justice or slapstick humor. The only limits are the edges of the paper. Learn basic skills and techniques from a nationally syndicated comic artist in six action packed classes. Stanley Kubrick said: “The best thing for young filmmakers to do is get their hands on a camera and make a film.” This workshop will guide teens through the entire process of making a short film. Participants will work collaboratively to learn and carry out each part of the filmmaking process including scripting, shooting and editing a short film. We will discuss how to write a “doable” script, learn how to use the Canon XF100, and learn how to use Final Cut Pro to edit. This workshop is for teens age 12 to 16. No experience is required. All materials are provided. In this intensive course, students will several portfolio pieces, which are intended to address standard portfolio requirements. There will be a strong emphasis on observational drawing, design, and concept development beyond basic studio assignments. Drawings should reflect observational skills, technical facility, and expressive development. Individual and group critiques will also be integrated into the studio experience along with an understanding and articulation of visual arts language. Students will need to do some work outside of class to complete studio assignments as well as work in sketchbooks. Your phone is more than a selfie machine! Unlock the power of your phone’s camera and use it to create great photographs. Learn how to change settings, focus, and exposure. Learn different ways of seeing the world through your lens. We will have a brief studio lesson and then move outdoors to explore the town. 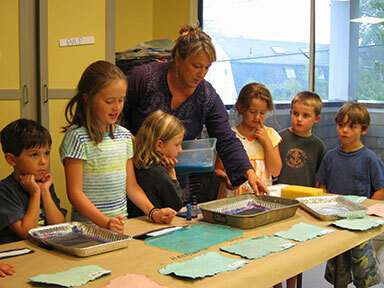 Enjoy creative art-making featuring projects in printmaking, clay, watercolor and multi-media. Explore the ocean floor using watercolor, clay, sand, and more to discover magical sea creatures and plant life. Or fly away in a hot air balloon, or on the wings of a butterfly using papier mache, clay and paint. And on dry land discover the rainforest’s exotic flora and fauna using combinations of materials in a collage of the imagination. Come join the fun and be refreshed. Embark on a creative adventure this summer with the South Shore Art Center’s popular Art Afternoons, reprised as morning sessions. Students will explore, create and investigate art through clay, drawing, painting, printmaking, collage, and sculpture. There will be both group and individual projects in a fun, supportive, and air-conditioned environment. Students will host an “art reception” at the end of the week—all family and friends welcome! Shape, twist, pinch and model with different types of clay, try wheel throwing and hand building with coil and slab. Students will also be introduced to appropriate vocabulary related to methods, materials and techniques used in ceramic media. Create a menagerie of animals, real, fantastic, ancient, and mythological. Or create your own guardian creature. Flip the light fantastic with a tie-dye creation, or weave different fibers into unusual patterns while you explore macramé. Still interested in exploring the world of clay? In this class, students will create a variety of two-dimensional and three-dimensional clay pieces using different types of clay and techniques to develop sensory skills and imaginative applications of texture and balance as expressive vehicles of art production. Flying fish, coral caves, and deep sea creatures are waiting to be discovered by the underwater traveler through the expression of texture, mixed media and frottage. Return to those techniques you loved so much and didn’t have time to explore or combine in different ways the last time you were crazy for clay. Scholarships for elementary age school children are available based on need through the generosity of the Lois Weltman Memorial Fund for Children. Please inquire at SSAC office for more information. In addition, financial aid is available to all SSAC students based on need. • Courses need a minimum of 5 students to run. Please help ensure that they run by signing up no later than 7 days prior to the first class. • In the event of inclement weather, the Art Center follows the Cohasset Public Schools school closings. Should a storm emerge during the day, please call 781-383-2787 x 10 for any class cancellations.